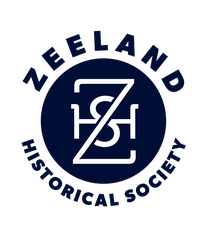 Those who emigrated from the Netherlands to settle in Zeeland held reunions to renew acquaintances and celebrate their success. They were asked to fill out information for the 60th reunion, held in 1907. These forms contain valuable information about where the settlers had lived in the Netherlands, birthdates, their family members, the name of the trans-Atlantic ship and means of transportation to Michigan, dates of arrival, and the names of other passengers. We have three volumes of these forms. The forms and responses were written in Dutch. Some people opted to write a short narrative about their experiences and the reason(s) for leaving the Netherlands. These were also written in Dutch, but there is a fourth volume in the set, which provides English translations for these narratives. The table below indexes the names of the settlers who filled out forms, with volume and page number of each entry. Note: The last column shows the page number in an English translation, which is located in volume four. The "Oude Nederzetters" (Old Settlers) listed below are located in the Zeeland Museum's research room. 1 30 Bolks Gerrit J. 1 31 Boone T. H.
1 46 Brower Wed. G. J. 1 61 DeJong Mrs. C.
1 16 DePree Catharina L.
1 74 DePree Johannes P.
3 269 Douma Ijka F.
2 101 Douma Wopke R.
1 109 Elferdink Mrs. W.
1 112 Elzinga Trijntje K.
2 212 Hofman Elizabeth K.
1 121 Hofman Janna K.
2 135 Hovenga Mrs. J. 2 138 Huizinga Albert T.
2 139 Huizinga Gerritt T.
2 156 Kaslander Leendert W.
2 161 Kleinheksel J. H.
2 166 Klijn John C.
2 163 Klomparens H. J. 2 172 Kollen Hendrik J. 2 181 Kroeze G. J. 2 187 Kropschot Hendrik J. 2 217 Nagelkerke Mrs. Wm. P.
2 228 Ossewaarde Mrs. R.
2 232 Plasman Mrs. F.
2 244 Russcher Henry Sr.
3 268 Stegenga Siebolt P.
3 270 Steketee George C.
3 273 Streng Christian L.
3 283 TerVree J. A. 3 302 VanDenBosch Mrs. T. K.
3 298 VandenBosch Tamme M.
3 303 VanderMeer Sybrand J. 3 305 VanderMeulen Mrs. J. 3 311 VanDijk Hendrik R.
3 310 VanDijk Mrs. J. 3 317 VanHees Albertus G.
3 329 VanZoeren Gerrit J. 3 342 Visser Leendert D.
3 369 Zwemer Adrian C.